December’s job numbers show Saskatchewan had the second highest percentage employment growth rate among the provinces between 2007 and 2017 and added 5,000 jobs in December, starting the year from a position of strength. 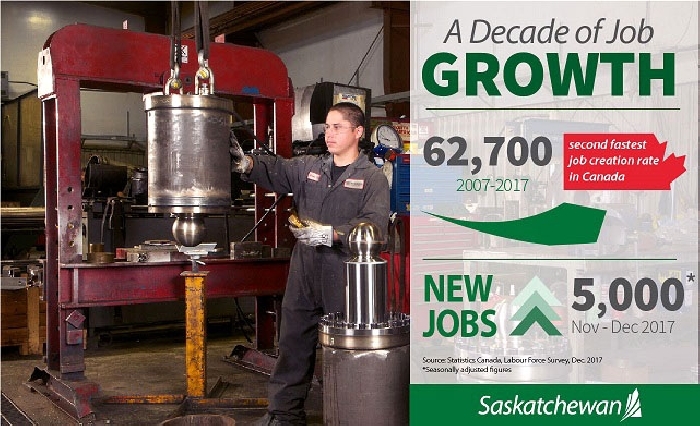 There have been 62,700 jobs created over the last decade in Saskatchewan, a 12.4 per cent increase, well above the national rate of 9.8 per cent. Among the provinces, Saskatchewan had the fifth lowest annual average unemployment rate in 2017 at 6.3 per cent. Nationally, the annual average unemployment rate was 6.3 per cent. There was an average of 567,600 people employed in 2017, 900 fewer than in 2016. Major year-over-year gains were reported for trade, up 3,800; manufacturing, up 2,300; and professional, scientific and technical services, up 2,100 compared to 2016. Youth unemployment rate was 11.8 per cent, fourth lowest among the provinces. On a month-over-month basis, there was an increase of 5,000 jobs (seasonally adjusted) between November 2017 and December 2017. December 2017’s unemployment rate was 6.4 per cent, down from 6.6 per cent in December 2016.